The Bestest Recipes Online: Fast Guacamole. Cut the avocados in half lengthwise, remove seeds. Scoop out pulp with a spoon; put the pulp into a small bowl. Peel the tomato dipping in boiling water. Dice tomato and add to bowl. Peel the red onion. Dice onion and add to bowl. Add to the bowl the lemon or lime juice, and salt. Mix well. Add sour cream, red pepper flakes and cilantro, mix well. 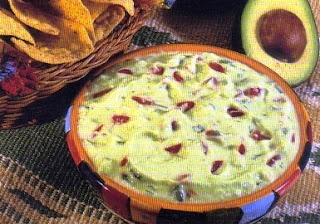 Pass the Guacamole Mixture into a serving bowl. Serve with chips or quesadillas.